It’s a grey day in Bath. Overcast sky with a threat of rain and the bath stone buildings are looking a little glum – less butterscotch, more beige. But that doesn’t stop the visitors. The city is packed full of shoppers, tourists and summer language school students crowding the pavements and overflowing the coffee shops. There is a long queue for the Roman Baths, which snakes round into Abbey Square. The Jane Austen Centre in Gay Street is doing good business selling bookmarks and mugs, and the Georgian Gentleman – rosy-faced and with mutton chop whiskers, who often poses in the doorway in and out of season, is smiling generously for selfies with Japanese and American tourists. It’s a slow start up at the Royal Crescent for the’ Picnic in the Park’ celebrations and a Day in the Life of the Royal Crescent. 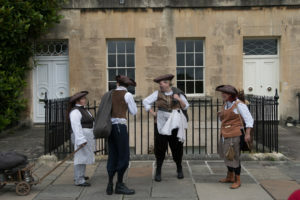 Members of the Natural Theatre Company are doing their best to entertain people who are arriving in dribs and drabs to see the crescent, unaware of what is happening. As they stroll up and down, taking pictures, watching the goings-on, a little mystified at first, they start to join in and interact with the players. The raucous washerwomen manage to cajole a youngster to help them peg out the laundry. 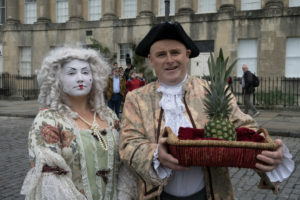 Pineapple Man, accompanied by his amazing silent white-faced consort, proudly shows off his latest rich man’s ‘toy’ – a pineapple sitting on a velvet cushion in a small basket. ‘You can hire my pineapple tonight for a shilling to show your friends at your dinner party,’ he tells the couple in front of me. He isn’t kidding either. In Jane Austen’s day, pineapples were a rare sight and very expensive to buy. 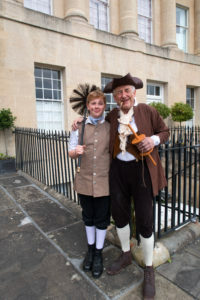 I stop to chat to the Chimney Sweeps – father and son, Pavel and Zac Douglas, volunteer actors with the Natural Theatre Company. Obviously, Zac is too big now to go up chimneys but his dad says that he is learning the ropes to follow in his footsteps but if that doesn’t work out then it’s likely to be delivering coal for the lad. 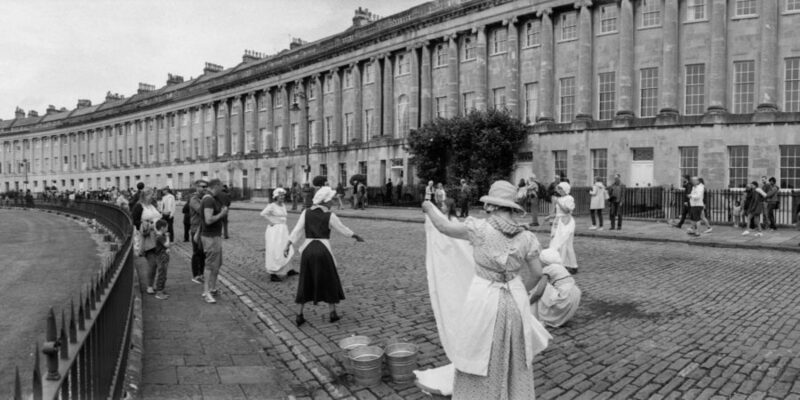 Delivering coal was a dirty job in Jane Austen’s day but someone had to do it.